Unlike what many believe, the end of summer does not mean the end of lawn care for the year. Infact, some would say that the autumn and winter periods are one of the most important periods and are vital for lawn growth. As the autumn period turns into winter, it is important to ensure that any fallen leaves are gathered and picked up to avoid any disease on your turf. Matted leaves can often block sunlight and reduce water evaporation causing mould, fungus and disease. If the weather remains mild and dry it is possible to cut your turf to keep it tidy and healthy in this season. 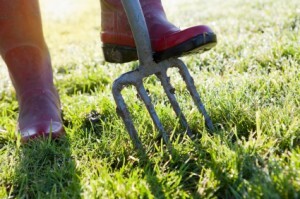 Aeration is also recommended using a garden fork to reduce compaction from the summer months and will increase the amount of air, water and nutrients reaching the roots. Once you have removed any leaves from your lawn and have thoroughly aerated throughout we recommend feeding using an autumn fertiliser. Autumn feed contains iron sulphate to get rid of moss, as well as nutrients to keep it healthy over winter. At Ivinghoe Turf we have been growing and supplying high quality garden turf to all areas of Hertfordshire, Bedfordshire and Buckinghamshire for more than 30 years. Our variety of turf grades are suitable for all scenarios. This entry was posted in lawn care, News. Bookmark the permalink. Can You Lay Turf All Year Round? How Can I Prepare For Turf?